For more information about work packages, please see the category Work packages. Create a planning by adding activities. In the Planning page, in the Edit group, click New Activity. Enter a name directly in the row. You can also add another project element like a milestone. For more information, see Create and edit a milestone. In the Basic information area, in the Name box, you can change a name. In the Group box choose a group to which the activity belongs. It defines the costs for the activity. Each group has an internal price per hour. You can change this price/group or add a new one via the InLoox PM Web App options. For more information, see Generate and edit groups. In the Basic information area, you can also define whether a planning element is a milestone. Select Item is a milestone check box. In the Highlight area, select from the Flag drop-down list a color to mark the activity in the planning list. You can also select a color to mark the activity in the Gantt chart by clicking Color and choosing some from the drop-down list. In the Time frame area, define its duration and dependencies regarding other planning elements. 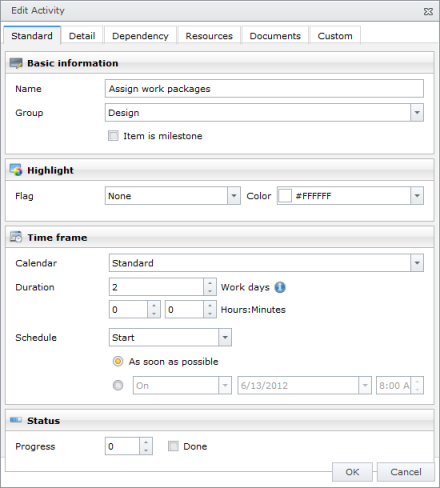 For more information on how to set a working time calendar, see Create a working time calendar. In the Duration box, enter the duration in days and enter the hours in the box below. In the Schedule box, define the constraints of the activity. Choose between Start or End. The constraint As soon as possible is set up as default value for the Start and As late as possible for the End. In the Status area, define the progress or activate the done check box to display the processing status of the activity. In the Description box enter some important information on the activity, e.g. the targeted deliverables or internal remarks. The information from the Description box will be sent via notification to the divided resources. See Display and process work package for more information about the notifications. InLoox PM Web App provides you with a range of formatting features. For the detailed description, see Create and change comments in the Customize comments section. In the Parent box, select a group or parent, to which the activity belongs. In the WBS code box, enter a work breakdown structure code to identify activities and milestones in large projects. In the Location box, enter a location. Choose from the Available list one planning element and click >>. InLoox PM Web App creates a chronological interdependency between the activity and the selected successor. The Selected list contains all successors of the activity currently being edited. To remove a successor click on the button <<. InLoox PM Web App consequently deletes the chronological interdependency between the activity and the selected successor. Define the dependency between planning elements by choosing the item in the Selected list. For more information about dependencies and lags, see Create planning elements dependency. For more information on how to add a new custom field in InLoox PM Web App, see Create a custom field. Create and edit an activity - InLoox • Copyright 1999-2019 © InLoox GmbH. Tous droits réservés.